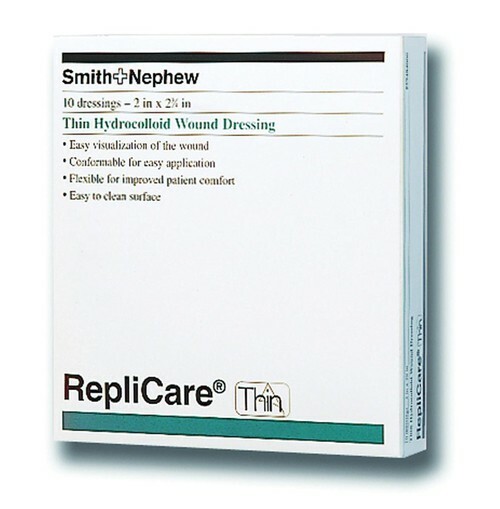 RepliCare Thin Hydrocolloid Dressing is a thin, high-strength hydrocolloid dressing designed to maintain a moist wound environment that assists in promoting autolytic debridement while managing low levels of exudate. Featuring a sterile, self-adhering design that makes RepliCare Thin easy to apply, even with gloves, that utilizes high cohesive properties that keep the dressing from falling apart and leaving the residue in the wound, so that there is minimal risk of irritation, which provides a long-lasting, confident experience for the user. This also allows for fewer dressing changes, reducing the exposure to the elements, resulting in less waste and lower risk of contamination. RepliCare Thin Hydrocolloid Dressing retains the superior comfortability of the original RepliCare, while also featuring a sleeker, more sheer design, stretching easily and returning to its original shape more completely than other hydrocolloid dressings, even over awkward areas like elbows and knees. The suppleness and flexibility allows the dressings to give without migrating, minimizing granulation tissue injury and damage to periwound skin integrity. The dressing is flexible enough to provide ease of mobility without any annoying pulling or constricting of the skin, especially over joints. The thin profile of the dressing is also discreet enough to be cosmetically acceptable to patients. How long can the thin dressing remain before it needs to be replaced? How does it compare replacement time-wise with the regular dressing? The maximum amount of wear time between changes is seven days; however, that depends on a number of factors including exudate.